Circulatory system helps to circulate blood with all the essential nutrient and oxygenated blood reach every corner and parts of the body. Along with this, the collections of unfiltered blood from parts are also well accomplished by circulatory system. The main organ involved in blood circulation is the heart. Heart is the very important organ for human body that is excellently modified for separation of filtered and unfiltered blood thus, helping in proper functioning of the body. Heart is a small organ, almost the size of our fist that rest on the diaphragm on the midline of thoracic cavity and is more towards the left side of the chest. Heart has three different layers, epicardium, myocardium and the endocardium. Epicardium is the outer layer that is made of mesothelium whereas myocardium is the middle layer that is made up of cardiac muscle tissue and finally lies the endocardium that is the thin layer of endothelium. This way heart is made of three different layers. Heart is also protected by a membrane called pericardium. This pericardium is divided into two parts: fibrous pericardium and serous pericardium. Fibrous pericardium is the outer layer and made up of dense irregular connective tissue that prevents heart from overstretching, keeps the heart in correct place and protects it whereas the inner serous pericardium is further divided into different layers, and the cells of this layer secrete pericardial fluid that reduces friction between different layers of serous pericardium. Beside the division of layers, heart is also divided into different chambers. Altogether there are four chambers in a heart; the upper two chambers are atria that receive blood and lower two chambers are the ventricles that pump the blood. The right atrium receives blood from superior vene cava, inferior vene cava and coronary sinus. Right and left atrium is separated by interatrial septum. The flow of blood from right atrium to right ventricle is controlled by tricuspid valve also called right atrioventricualr valve. Right ventricle forms most of the anterior surface of the heart and consists of series of ridges called trabeculae carneae. Tricuspid valve that links right atrium with right ventricle is connected to cordae tendineae and this cordae tendineae is connected to papillary muscle. Beside this, a septum that separates right ventricle from left ventricle is called interventricular septum. From the right ventricle blood goes to pulmonary trunk that takes blood away from the heart. Left atrium receives blood through pulmonary veins that comes from the lungs. Blood when passes from left atrium to left ventricle is guarded by a valve called bicuspid valve also called left atrioventricular valve. Left ventricle is the thickest chamber that also has trabeculae carnea and cordae tendinae attach to papillary muscles. Blood from left ventricle passes to the aorta also called aortic valve. Aorta is further divided into ascending aorta, descending aorta and arch of the aorta. 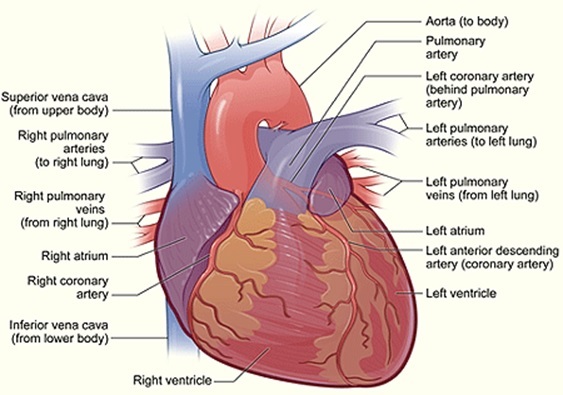 Among all these three, blood from ascending aorta is carried to the wall of heart and rest two aorta carries it to the different parts of the body. The wall of ventricle i.e. myocardium of ventricle is quite thick in comparison to the atrium because it has to pump blood to greater distance with high pressure. But among the two ventricles, wall of left ventricle is much thicker than right ventricle because it pumps oxygenated blood to larger distance. Tricuspid and bicuspid valve located between atria and ventricle is also called AV valve. When AV valve is open, ventricle contract and the blood move from atria to ventricle whereas the aortic and semi lunar valves are also called SL valve. This valve allows flow of blood from heart to the arteries, thus preventing its backflow to the ventricle. When pressure in ventricle exceeds the pressure of arteries, it allows blood to flow from ventricle to the pulmonary trunk and aorta. But when the ventricle relaxes, blood starts to flow towards the heart, thus closing the semi lunar valve. Heart pumps the blood in two different ways, systematic circulation and pulmonary circulation. Among the two sides of the heart, left side does the systematic circulation and right side does the pulmonary circulation. The left side receives the oxygenated blood from the lungs and the left ventricle eject it into the aorta. From the aorta blood enters systemic arteries and from there it is supplied to different organs of the body. Then venules pick up deoxygenated blood from parts of the body and thus forming system veins. Now the deoxygenated blood is send to the right atrium and this circulation is called pulmonary circulation. From right ventricle it enters right ventricle then to pulmonary trunk then to pulmonary arteries that sends blood to lungs. Here pulmonary capillaries picks oxygenated blood and again the process continues where oxygenated blood flow into pulmonary veins and then to the left atrium. Since the nutrients are not easily diffused form blood to the cells of the heart. Hence, two coronary artery, left and right branch from aorta and supply oxygenated blood to the myocardium, a layer of heart. Likewise, coronary veins collect deoxygenated blood from the heart and empty it into right atrium. This way different artery and veins supply blood to heart and different part of the body, thus forming a complete circulatory system of human body. The excitation begins from the SA node that lies inferior and lateral to the opening of the venecava. Then the action potential travel throughout the atria and reaches the AV node, located in the interatrial septum. From the AV node, it enters AV bundle also called bundle of His. From AV bundle it enters right and left bundle that extends through the interventricular septum towards the apex of heart. It reaches the Purkinje fiber that conducts the impulse to the reminder of myocardium of ventricle due to which ventricle contract, pushing the blood upward towards the semi lunar valve. Therefore, SA node generates action potential 100 times per minute. SA node is also called natural pacemaker because the impulse is first generated here and then spread to the other areas. Electrocardiogram: it is the scientific recording of impulse that is generated by heart, because when action potential is generated, it releases electric signal that can be excellently traced by the ECG thus, helping to detect the condition of the heart and the instrument used for this purpose is called electrocardiograph. Atrial systole: it last for 0.1sec when ventricle relaxes and atrial depolarization causes atrial systole. The contraction of atria exerts pressure on the blood through AV valve into the ventricle. The end of atrial systole is also followed by the end of the ventricular diastole and each ventricle contains 130mL at the end of diastole. Therefore, this blood volume is called EDV or end- diastolic volume. Ventricular systole: it last for 0.3 sec, at this phase ventricle is contracting and atria are relaxed. Ventricular depolarization causes ventricular systole that builds up pressure for blood inside the ventricle thus, pushes it against the AV valve and hence shutting them. Isovolumetric contraction is the period of 0.5 sec when SL and AV valves are closed. Whereas there is a period when ventricular ejection takes place that last for 0.25 sec and at this period left ventricle surpasses aortic pressure and pressure of right ventricular rises above the pulmonary trunk, thus opening both the SL valve. 70mL of blood is ejected in aorta and pulmonary trunk resp. and the remaining blood in the ventricle i.e. 60mL is called ESV i.e. end systolic volume. Relaxation period: it last for 0.4sec when atria and ventricle are relaxing. The increase in heart beat shortens the relaxation period. Our heart produces certain sound that can be heard by an instrument called stethoscope, i.e. lubb and dubb. Lubb is longer and stronger than dubb. Both these sounds are heard due to closure of valves, one due to closure of AV valve and other due to SL valve resp. This way our heart works and performs brilliantly to keep our body parts function properly. Therefore, we need to take all the possible care so that all the arteries and veins remain active and free from any kind of injury or diseases so as to live a healthy life.